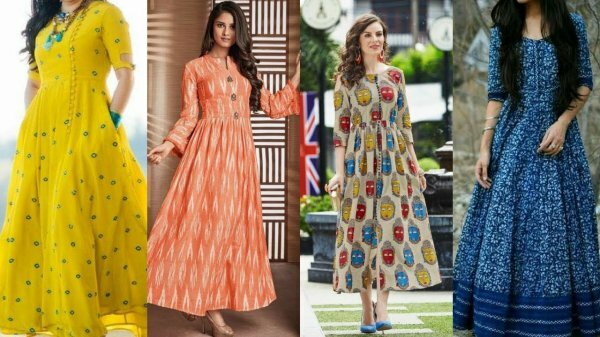 This article gives tips about how to find the perfect cotton kurti for yourself, depending on your body shape and other criteria. It also suggests 10 appealing kurtis available online for you to buy. There are binus tips about where you can find good kurtis in India. 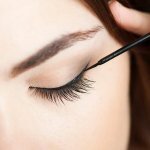 You have kurtis for everyone and for every occasion, styled uniquely for all kinds of daily fashion wear. However, if it isn’t styled appropriately and paired with a suitable bottom, the entire style would fall flat. There are different styles of kurtis which are in fashion. For instance, tail-cut kurtis which match the asymmetrical kurtis somewhat have a slightly longer fall at the back. These suit most age groups of young-middle aged women in the tall, petite, hourglass, pear, triangle-shaped body structures and go well with anything that’s full length like a jegging or legging. Then there’s the flared kurti which looks really chic and graceful, befitting either formal or daily wear. The hemline in this style opens up on both sides, adding a little volume and making it more attractive. A kaftan or poncho styled kurti is comfortable and airy that can conceal the unappealing bulge, should there be any and a stylish option for women with a heavy build. A front-slit kurti is made with a contemporary twist with slits on the front and not on the sides, best for tall women, pear, petite and triangle-shaped bodies, apt with a pair of palazzos. A pintuck kurti with a straight cut is a detailing that adds elegance to your outfit, and when paired with cotton, handloom or chanderi fabrics, will look really charming. 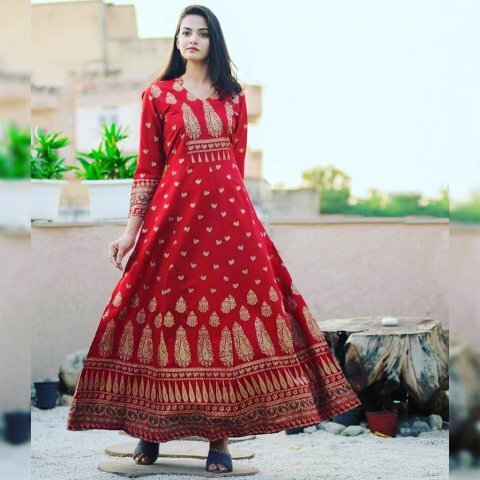 There are styles one too many for those interested in changing trends and include several variants like shirt styles, angarakha, denim, printed, tunic, short flared, overlay styled, long straight cut, Anarkali, dhoti style or jacket styled kurtis. When choosing a kurti, ensure that you select a different style each time, experiment with different patterns and shades, incorporating different colours to your wardrobe and wear them in line with the changing seasons. Printed kurtis come in a wide variety of playful colours, while soft tones and neon colours go well for the summer weather, greys and blacks suit the winter season. In terms of work on the kurtis, prints with intricate embroideries of gota patti, mirror work, zari, aari tari, and zardozi look elegant for party and evening wear. Fusions are a rage these days, where designs are modified keeping in mind the traditional designs with the changing preferences of the modern world womenfolk. 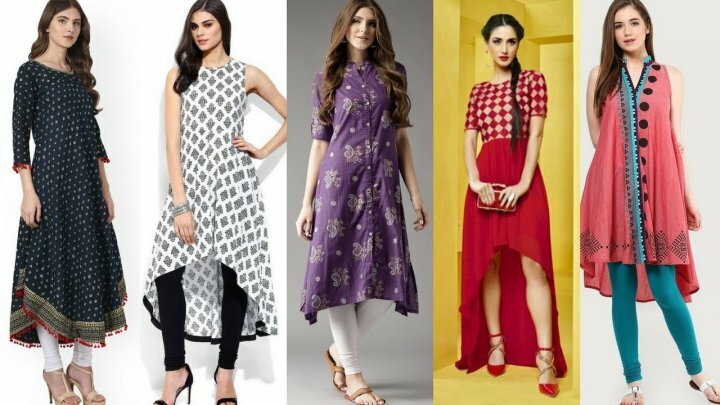 From indo-western styles to traditional silhouettes, modern prints making classy style statements, front open kurtis teamed with cigarette pants, palazzos or skirts, there are myriad examples of fusion kurtis. If you’re interested in different shades and colours, when selecting your kurti look for similar palette colours or matching shades, with minimalist prints that are visually appealing and accessories should be a subtle match in line with your style. Who doesn’t like dressing up well? And when your clothes match your build, your personality is enhanced at a completely different level. 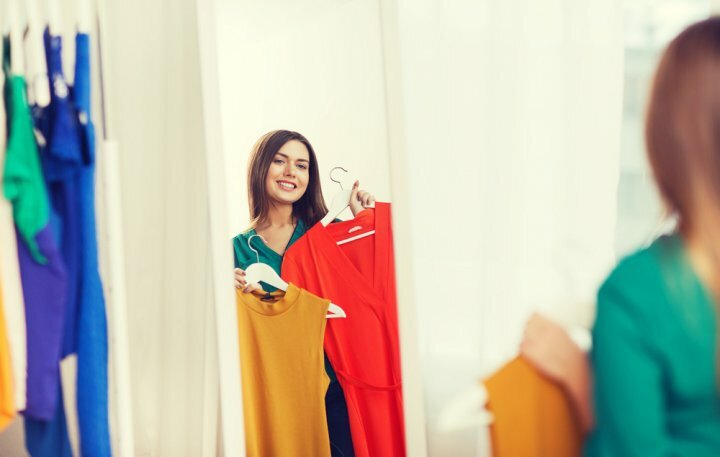 When selecting kurtis according to your body structure some areas you should be mindful of would be colours, fabrics, neck style, cuts and work. For instance, women with round shoulders, average to big bustline, strong legs, full waist and a flat hip should choose kurtis in dark shades, in cotton or silk fabrics which are cling-free, cut in A-line styles that gives a flowy outline and necklines that are V-shaped or embellished to draw attention to the bust. These kurtis can be embroidered on the hem and shoulders with flared or cuff sleeves. For women with a straight shoulder line & rib cage, subtly defined waist, an average abdomen and straight hips, broad & deep neck kurtis, with a belt to define their waist or a style that creates the illusion of a curvy silhouette, an Anarkali style, or a nipped waist will look good, matched with sleek bottoms like jeggings or churidars. 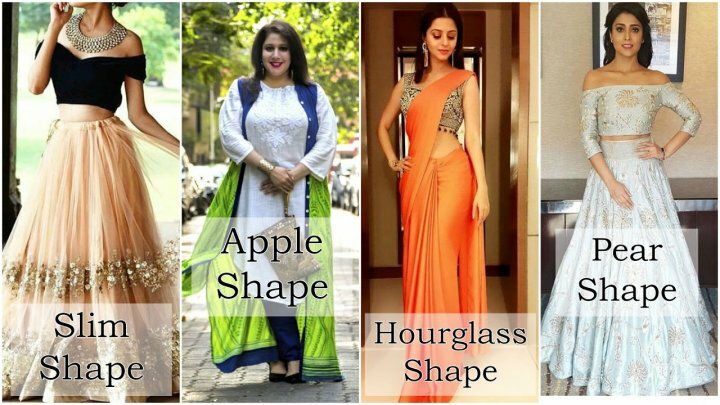 A pear-shaped body would look good in light coloured kurtis with dark bottoms, in an Anarkali or flared style, with texture or prints, and sleeves that make the arms look fuller and rouched. Women with a defined waistline, bust and fine hips can carry off most styles and types of kurtis with deep necklines. 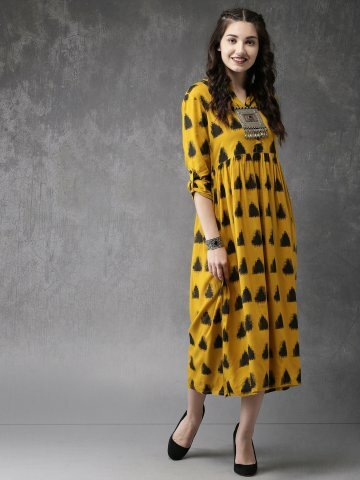 Women with an inverted triangle shaped structure look good in raglan sleeved kurtis that create an illusion of more evenly distributed curves or flares that fit well around the bust. Deep low necklines take the attention away from the broad shoulders, while high necklines should be avoided completely and long kurti styles should not be hip-hugging. India is rich with an excess of handlooms, weaves and skilled fabrics, produced locally, each with a unique style and treated as family heirlooms through generations. The South Cotton Woven Legacy A-line Checked Kurti comes with a notched round neck and ¾ sleeves and side slits. This kurti is handcrafted and may be prone to color bleeding on account of the use of natural dyes. Material used is 100% cotton and is best hand-washed. The south cotton woven checked kurti is priced at Rs.599 and is available on Myntra. 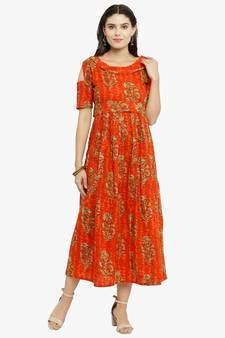 This orange cotton leaf print A-line box pleat kurti comes with one cold-shouldered sleeve and one placket-styled sleeve with a button. The woven cotton kurti has a shirt style collar with a simple width-wise belt on the front and a flared hem. It is priced at Rs.1,049 and is available on Mirraw. This Indigo Asymmetrical Hand Block Printed Kurti with an antique side coin design brings a beautiful blend of ethnic and contemporary fashion. With a round neckline and ¾ sleeves, this kurti is priced at Rs.1,755 and would look really smart with a pair of teal coloured palazzos or pants. It is available for purchase on www.missprintclothing.com. Round neck with ¾ sleeves and patterned with gotta patti work, the Cotton Ombre Kurti features an Umrah tie and dye look with an A-line collected cut. 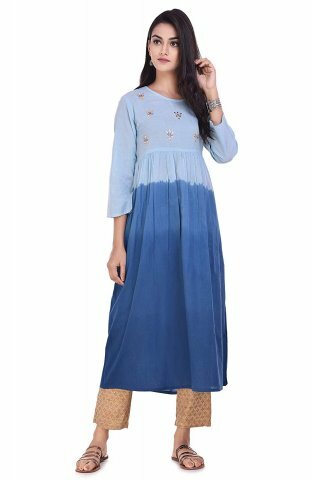 The kurti is made loose around the torso, has sleeves with a fitted cuff, and has a 49” length and comes in two colours, off-white & yellow or sky blue & denim blue, both adorned with light gold gotta patti on the front side. 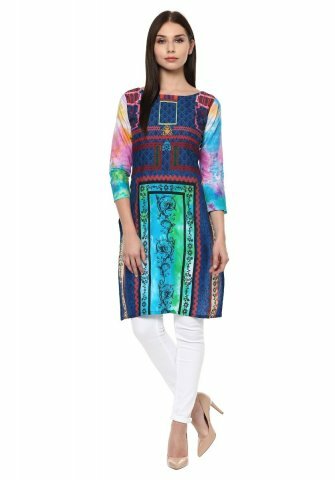 The Cotton Ombre Tie & Dye Kurti,available on Amazon, is priced at Rs. 599 and will look smart paired with white cotton pants, a pair of jeans or a skirt. Featuring a chic tassel, a straight cut in short length and a round neck, the floral embroidered kurti with roll-up sleeves is made in pure cotton fabric, styled for casual wear with ¾ sleeves. The floral embroidery on the around the neck extending down just to the base of the rib cage is designed in colours of white, blue and red, giving it an uptown style. Available in sizes small to XXL, the Floral Flat Kurti is priced at Rs.1,499 on www.maxfashion.in and would look best teamed with a pair of white palazzos and strappy heels. 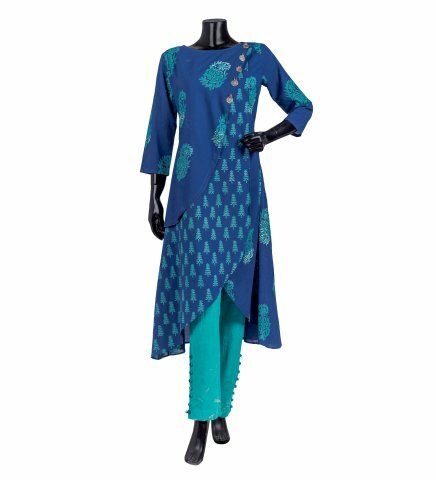 This blue A-line cotton kurti with printed pattern all through the length of the kurti comes with a round neck style, a closed back and is of ankle length. Best for casual wear, the kurti can also be worn as a dress as it includes a plain belt in pink through a panel stitched on the kurti. This blue and white printed kurti is priced at Rs.570 on Craftsvilla. The pink pigment printed cotton blend ethnic kurti is made in a regular fit style with a V-neck and ¾ sleeves designed as an Angarakha. With the pigment patterned print in gold on the front torso and dull pigment print throughout the length, the Cotton Angarakha Kurti in pink is available in sizes small to XXL and is priced at Rs.1,428 on Spoyl. A simple cotton kurti designed like a Pakistani styled kurta, with a complex digital print in multi-colours, this Digital Cotton Kurti is apt for office or daily wear, with a straight cut, knee length and floral pattern. The cotton kurti has a round neck with ¾ sleeves and has grey colour for the base, available in XL and 2XL sizes, priced at Rs.1,049 on Voonik. This solid kurti in coral colour with a printed yoke is made of cotton fabric with a round neck and ¾ sleeves. Appropriate for casual wear, this coral coloured kurti is 45” long from waist to bottom hem and available in sizes medium to XXL and is priced at Rs.374 on Amazon. Designed in Chikankari, one of the most popular art forms in India from Lucknow, this onion pink coloured, hand-embroidered Chikan Kurti is no less a masterpiece, handcrafted with needlework in white cotton thread. 43” long, the cotton threads create some marked chikan embroidery stitches – keel kangan, bakhiya & phanda on a rich cotton base and make for a comfortable silhouette. The handcrafted chikan embroidered kurti comes with a V-neck and full sleeves, priced at Rs.1,290 and available in sizes small to XL, on www.adachikan.com. Lucknow is as popular for its chikankari work as it is for its food. A popular thread work, done by the skilled artisans of the Nawabi state, you can expect long length chikan kurtis in different pastel or bright shades, short kurtis apt for daily wear, each designed with intricate & elegant designs. Kashmir is known for its Pashmina fabric which is made of pashmina wool, obtained from a particular breed of Himalayan Goat. Popular for its soft and warm texture, the fabric is the best source of comfort in the winter season. Although a bit on the expensive side, it is quite a royal and beautiful addition to any wardrobe. Punjab is renowned for its joyful ethnicities and a lot of love. The phulkari embroidery also known as floral work is spun from a wheel in a beautiful pattern in rich and vibrant colours. It is found mostly in Patiala and Ambala on Kurtis making quite a mark in the style department. Rajasthan has bandhej or bandhani as one of the oldest forms of tie and dye work, available in a variety of colours, designs and patterns, found mostly in Jaipur, Udaipur, Bikaner, Bhilwara, Sikar or Ajmer. Gujarat has the patola, a hand-woven silk fabric created in Patan, with painted motifs and patterns inspired by nature and animals. Symbolising the rich tradition of Gujarat patola silk kurtis can be found in abundance in Rajkot in vibrant colours. Delhi is a shopper’s paradise and even though the city doesn’t really have any specific fabric or work to boast of in terms of uniqueness or invention, it is a crowd puller for providing some of the best styles, choice of fabrics and work in the market. 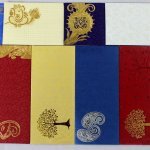 From casual wear available in export markets like Sarojini Nagar or Lajpat Nagar in cotton, silk or designer fabrics to the glitzy stores of Rajouri Garden or the crowded streets of Chandni Chowk, where you can find Bollywood inspired styles, regular or fashionable kurtis, Delhi has it all for all kinds of shoppers. Mumbai is where dreams find their destination and you can expect anything from a Bollywood inspired or designer labelled kurti with a multitude of colours and work. Known for its show-stopping designs, confident styling and competitive fashion, places like the Masrani Estate, Goregaon, Malad, Thane, Santacruz, Marine Lines, Vile Parle, Breach Candy, Juhu and Colaba are the best places to hunt for kurtis. Among ethnic wear, Kurtis are the most comfortable and what is more comfortable than one made of cotton? Our rich textile heritage offers innumerable style, prints and patterns in cotton wear so don't stick to boring old designs. Try experimenting with new looking for classy prints and styles across these options -whether that Jaipuri prints, khadi kurtas, ikat prints or bandhani.